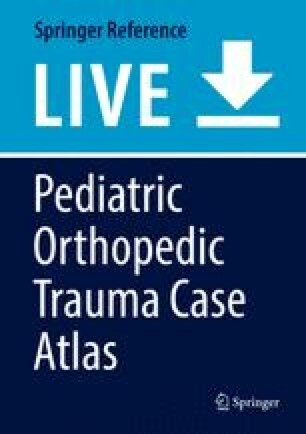 A 14-year-old boy was treated with a ballistic injury to the left humerus diaphysis associated with a brachial artery injury and radial nerve palsy. Emergent operative treatment for early stabilization of the fracture, arterial reconstruction and fasciotomy was performed. Delayed definitive treatment of the facture was done with Ilizarov-type circular external fixation. The fixator was removed after 4 months after evidence of full consolidation on radiographs. Conservative treatment of the radial nerve palsy resulted in full recovery of nerve motor and sensitive function after 5 months. Full range of motion of the elbow from 0° to 130° was obtained at the end of treatment.